Elephants, Injuries & Thunderstorms : 6 Hair-raising Encounters Around Bangalore ~ The Wandering Soul's Wander Tales..
For many, the marvellous weather may be Bangalore’s most attractive. But for me, the biggest charm of Bangalore is its supreme ability to make adventures happen! It’s not just the proximity of the city to the forests and mountains across south that’s amazing, it’s also the presence of a vibrant community making it possible to take off on an adventure just like that on a Friday night. With a gazillion mountains around and plenty of things to do in Bangalore as well, my weekends were all put to best use during my 7-year slog in the corporate world. If I had been anywhere else, I'm pretty sure I would’ve taken twice as longer to be where I am today. I'll be forever grateful to the Bangalore as a city that gave flight to my dreams! Before moving to Bangalore, I had no idea what Western Ghats were or how adrenaline-fuelled my weekends would soon become. There are elephants, leeches, snakes, bison and even tigers in these forests that I frequented more than I did anywhere else in the country. The initial forays were cripplingly terrifying and I found some comfort in the hypothesis of safety in numbers. However, very soon I got used to outdoors and the idea that every living creature isn’t out to get me. Collectively, we pushed our limits so far along that normally terrifying encounters soon became a norm. In every one of those situations, anything could’ve gone wrong and if it had, it would’ve been fatal. But thankfully, they are nothing more than exciting memories trapped in my mind for eternity today. And I can say that nothing feels more alive than to skirt danger and live to tell the tale. Now that I’m away from the Western Ghats, I’m missing those days terribly and so here’s me reminiscing some insane moments from the past. Pretty pink flowers blossom on the slopes of Western Ghats during monsoon. Pictured here, us getting down Kumara Parvatha on the second morning. 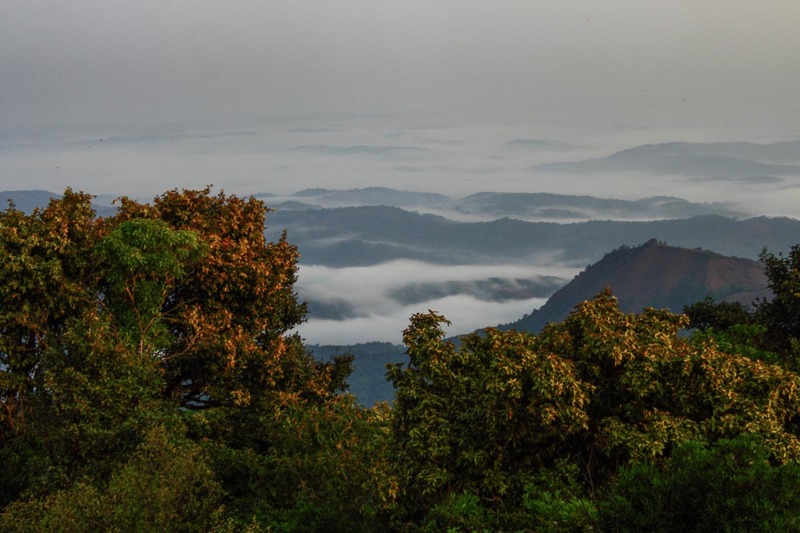 It was a beautiful monsoon weekend and just four of us were hiking up to Kumara Parvatha, a 1700m high peak in Pushpagiri Wildlife Sanctuary in Kodagu district. The mist-draped slopes were covered in a luxuriant green coat peppered with a profusion of rock balsams(pretty pink flowers). We left our luggage at a halfway stop and scampered to the peak intending to return to the halfway point by nightfall to camp. But we reached the peak only by 4 in the evening because of a vertical rocky patch that had become very slippery from all the rain. We crossed this on our way up using the ropes from another team. That would be the warning we missed that led to the eventual stranding. Once at the peak, heaven’s gates opened up and it poured in a deluge. With that, any chance of us getting down the rocky patch was sealed shut. We decided to wait out the storm at the peak; it was an insanely stupid decision. Peaks in Western Ghats can get very cold, like down to single digit temperatures and all we had with us were soaking wet jackets and little else. The only other group there from whom we took help earlier, took pity on us again and lent us one of their tents squeezing their five big bodies into one 4-man tent. Godsends, those boys! Sheltering our soaking wet bodies from the torrential downpour that battered us all night long, we shivered involuntarily inside the tent in an attempt to generate heat. Cold water dripped from wet clothes and even colder water from the rain flowed below our tent destroying any chances to stay warm. It was undoubtedly the coldest and longest night of my life so far. Having not eaten any food, the incessant shivering drained me of any and all energy leaving me almost incapacitated. The next sunrise felt like it came after an eternity and we dragged our exhausted selves down the rock patch again with the help of those boys. Dizzy and disoriented, but glad to have survived the ordeal somehow, we thanked our stars before heading back to Bangalore with no harm that a full night’s sleep couldn’t cure. It was the summer of 2011 when I caught the cycling bug. Most of the weekends that year were spent either riding somewhere, making ride plans or buying cycling gear for someone or the other. In short, I was obsessed with cycling and I had this nice group with whom I used to ride regularly in the Western Ghats. Once, we planned to ride up to the hill station of Munnar in Kerala. We we transported our bikes to Chinnar Wildlife Sanctuary and started the 70km uphill ride to Munnar but it was already mid-afternoon. Searing heat and winding uphills made the ride exhausting but our slog continued unimpeded. But it was already getting dark and we had at least 25 more kilometers before reaching Munnar. Few others and me let the support vehicle go ahead willingly and had no option but to continue pedalling in the elephant territory after dark until we reached. The climbs were long, tiring and seemed never ending. Pushing through with all our might, we found a sliver lining when we saw the last 12kms to reach Munnar were completely downhill. But none of us had anticipated this and we didn’t carry any headlights apart from meek torches. Thus started our crazy downhill ride in the dark. Heady with a mix of pride that we had successfully biked to our destination as intended when almost 70% of the group had given up and the fear of riding blind in the mountains, we whizzed past the curves by taking calculated risks and sticking close to the safer side of the road. Few of us crashed, few of us fumbled but we arrived fine in Munnar by dinnertime and spirits were flying so high that we could’ve climbed another mountain that night! Teeming with all sorts of wildlife, an animal encounter in Western Ghats is always a possibility. But like we always do, I never expected it to happen to me. One hot summer weekend, a group of us were hiking in Charmadi Ghats to reach the spectacular Bandaje Arbi(Falls) in Dakshina Kannada district. This is one of the tougher and least frequented treks in Karnataka. After a long day in the open grasslands and through dense forest, we reached a camping spot near the falls by late afternoon. The waterfalls, a massive stream tumbling down at least 200ft down a sheer rock face is a sight to behold. We camped in the wilderness by making sure someone always kept a watch and the fire lit to keep any of our wild compatriots at bay. The next morning we made a beeline along the rocky slopes to get down to the nearest village when we spotted a lone elephant in the grasslands about 50 feet below. It was terrifying! My heart was beating so hard it felt it could just break out of my ribcage. We had no guide with us and had no idea what to do. And the elephant was right in our path down. A herd of elephants is not as bad but a lone elephant means it was so rogue it was expelled from its herd. Rogue elephants are dangerous, they are unpredictable and they attack! After a long “stare me down” contest, with hearts in our mouths, we slowly made a move. The elephant didn’t budge and didn’t seem bothered. We moved as far away as possible from the elephant and then descended down into the forest. It was a long walk to the village but breathed a sigh of relief as soon as we spotted civilization. Once at the village, the first thing they inquired is if we happened to see a rogue elephant that has been causing much drama over the last few days. Phew, dodged a bullet there! The thing with outdoors is that one wrong step can lead to a whole lot of pain, even on the easiest of trails. Set amidst luxuriant greenery and wilderness deep inside the jungles of Mookambika Wildlife Sanctuary near Kollur, Arishinagundi falls is one the most spectacular falls of Western Ghats. One afternoon, a bunch of us set out with nothing more than a camera and change of clothes in hand to hike to a waterfall that was supposedly 15 minutes inside the jungle. We were all weary from the long hike and a sleepless camping night the day before. Half an hour into the hike, we saw no signs of a stream or a waterfall. Tired, everybody else decided to head back while six of us decided to find this elusive waterfall on an empty stomach. Armed with completely wrong information, we hiked back and forth inside the dense jungle making wild guesses on where the waterfall could be. When we finally found a person to ask, we realized the waterfall wasn’t 30 minutes away and that we were on the right path but it’s a long way to go. Having come this far, we desperately wanted to find that waterfall, so none of us gave up even though we were parched and completely drained of energy. After hiking for more than 3 hours, we finally found the diversion and scampered on the narrow trail to reach the stream and waterfall - only to be astounded by a loud roar of a ginormous cascade that was surprisingly sneaky! The effort had been completely worth it, but on the downside it was already 5 and we were somewhere deep inside the jungle. Refreshed after sharing a pack of glucose and plenty of water, we briskly hiked racing against the last of the light. We were being attacked by legions of leeches on the way back but we couldn’t stop. Hiking in the dark without a flashlight, in a jungle that’s famous for snakes including 13ft king cobras isn’t after all exactly encouraging. We breathed a sigh of relief only after collapsing in the river at the park entrance, cleaning our blood-drenched feet! Full ordeal here: Reaching Arishinagundi Falls, A Quest In Itself! Kodachadri peak in Shimoga district is famous for incredible views of cloud filled valleys. But the hike itself is not very beautiful nor exclusive. Hundreds of hikers and visitors in jeeps arrive in hordes to witness the beautiful phenomenon, so it can get very crowded at times. After hiking on the normal route couple of times, a bunch of us decided to take another obscure route over the ridges on the other side. Again, assuming safety in numbers I trudged through the dense jungles with only occasional scares - the rattling noises made by dry bamboo stems rubbing together. We hardly saw another soul as we found our way to a ridge by late afternoon. From here it was supposed to be walking on the ridges until we met the mountain chain on which Kodachadri peak is located. Everything was going fine until we were walking on a steep jagged cliff when wind picked up suddenly, bringing a deluge of white mist that blinded us entirely. A wrong step here and we would tumble down straight into the valley below. And the clincher being the slopes were way too steep and completely unsuitable as a campsite. That, and our water had completely run out. We fumbled around for quite sometime going up and down the cliff while being blasted by fierce winds. But eventually found a faint trail that would lead us to the ridges connecting to Kodachadri peak. What started as an already uncertain hike in the jungle went on to become briefly frightening before ending with the familiar view of clouds beneath my feet and a magnificent rainbow! Vellagavi, where no one wears footwear inside the village. Vellagavi is a small hamlet located on a hilltop deep inside Palani Hills near Kodaikanal. There are only two ways to reach this village — either through the jungle up from Kumbakarai or down the hill from Kodaikanal. A group of us decided to hike to this village on one summer weekend. The hike is only moderately difficult, so we thought of making it a bit more interesting and took a random jungle path following the stream rather than the trail. We were having quite an adventure figuring out a path when a novice hiker in our group sprained her leg real bad. We had to abandon our hike and get her to the road head, as she couldn’t walk any further. In the searing summer heat, we took turns lifting her to get her out of the thorn-filled bushy undergrowth. We made it to the road head only in the evening and she and her husband were on their way to Bangalore. We were back to square one, we were at the same place we started the hike in the morning, only difference being we were totally exhausted. It was almost 5 in the evening then. The locals already reliably informed us that attempting the trail at night is fraught with dangers — the bisons attack often, it is an old smuggling route and fierce dogs guard the orchards in the forest. We already had a brief encounter with a herd of bisons earlier that morning. Not wanting to leave the trail already, we decided to wing it in the night. It was a moon less night and storm clouds accumulated over our heads. Lightning crackled incessantly and fierce winds blew as we climbed the desolate trail passing through very dense jungle. There was fear lurking in all our minds but we kept trudging as fast as we could to reach the village. As the night became darker, any noise would freak us out. It could be a bison, or an elephant or any other animal. Darkness preyed upon our fear and I, for one, was petrified. Finally, hours later, dogs barked in the distance. It was both a good sign and bad. What if the dogs chased after us? Guard dogs are supposed to attack, they wouldn’t let us go unharmed if they catch us. On the other hand, it meant we were close to the village. With our hearts in our mouths, we trudged along to find relief wash us over when a faint flicker of lights came into view. Our ordeal had ended 4 hours since we started. The next morning, we found redemption in the incredible hospitality shown by the locals of Vellagavi. Also read: 13 Pictures Of Incredible Clouds From Western Ghats! I am often scared silly on hikes due to reasons that may seem trivial. But without that fear, there’s no excitement either. I might be petrified but I always do try. By doing so, I have collected hundreds of precious memories in that tinder box in my mind. That glorious redemption in the form of a reward — either an adrenaline overdose powered by gorgeous views or an overwhelming sense of accomplishment of overcoming obstacles — after a trying hike is precisely why most of us are addicted to pushing through even in the face of uncertainty when in outdoors. Have you had any such encounters that got a bit too adventurous? Let me know in the comments! You can have such adventures too, with these companies. Nirvana Nomads - A very fun bunch of guys organize treks and trips around Bangalore and some across India as well. I have hiked with them once and I can wholeheartedly recommend going with this company. Bangalore Ascenders - A volunteer-based club, 3 out of the 6 the adventures I listed above were with Bangalore Ascenders. I used to be a regular at BASC events during my stay in Bangalore and have made several good friends here. A fun bunch of people painstakingly organize treks and trips on purely cost-sharing model at BASC, as it is known. Everyone has to pitch in and help out with some tasks but because of all this, there's a high sense of community bonding and camaraderie. If you're looking for an independent and fun exploratory adventures, BASC surely comes highly recommended. Remember, this is a volunteer-based group with no outdoor professionals so to speak, just a bunch of people having crazy adventures together. The Adventure Gypsies - Started by few of my close pals and die-hard adventurers, you can be sure to go on a completely wild and awesome adventure with these guys. They all have their day jobs at the moment so you might not see much action here all the time but when they strike, it's one wild ride! So keep an eye out for any events they might come up with. Get Beyond Limits - I have never gone with them but a friend has gone on several treks with them. They look good with several interesting trails around Bangalore, you can try them out. Bangalore Mountaineering Club India - One of the earliest commercial trekking ventures in Bangalore, they've grown very big over the years. They have several regular departures over all the weekends in a month. I began my trekking journey in Bangalore with BMC but their big groups and limited options drove me to more adventurous and small-group departures soon after. However, they always have plenty of action of going on every other weekend, so you'll find a trek suiting your requirements easily here. P.S - This was fun! Soon I’ll do a Himalayan and Indian version of this. Nice exciting stories! Glad to have found someone who loves doing these stuffs.. Keep rocking!! When lost-- Fear, distress, concerns, regrets, chills and thrills..
At the top -- Bliss, serenity, scenic beauty, sunset, sunrise, camp-fire, cooking, dancing, philosophical talk, story telling, smiles and photo sessions.. I moved to bangalore on 1st of jan, of all days, hoping i too would get to see the all these wonders south india holds. but sadly, it hasn't happened so far except for an awesome trip to gokarna. but reading your post has really filled me up with this desire to travel to each one of these places, and a good thing they are all just weekend-long. however, i am wondering which of these places i can dare to go alone. don't have any equally or more enthusiastic people to go along with. could you please help with some tips on travelling alone to these places?